October 17 marks a huge change in Canadian legislation regarding the acquisition and use of cannabis. Legalization of cannabis has been the talk of the country for many years, and in recent weeks has become reality for all Canadians. Other conversations that have taken place were those regarding how the legalization will affect Canada’s athletes, particularly members of the USports community. It is important to comment that members of this national brand and those competing in university sport are not off the hook in recreational use of cannabis. Despite being legalized by the Government of Canada, cannabis remains one of many substances that appear on the World Anti-Doping Agency’s (WADA) Prohibited List. Cannabis is not the first legal substance to be on this list, as the list includes both illegal and legal substances. The Canadian Anti-Doping Program’s (CADP) prohibited list follows that of the WADA, as it is held to international standards. Because cannabis remains illegal in other countries around the world, WADA and subsequently CADP’s policy remains unaffected by its legalization in Canada. Just like before legalization, a positive test for cannabis can still result in a sanction. Cannabis is listed on the prohibited list as a threshold substance. This means that in the event of a test, if it is detected under a certain concentration then it will not be reported. This threshold does not permit regular use and despite the threshold, positive tests are frequent. Currently, cannabis is only prohibited in competition. That being said, there is no verified way of knowing how long cannabis takes to clear out of one’s system. Cannabinoids like THC are fat soluble and can be stored for long periods of time depending on metabolism. Frequency of use is a huge factor in determining how long the clearance time would be. One question worth posing is whether the use of medical marijuana would also be banned? The answer is yes. The use of cannabis for medical purposes is no different than use of other prohibited medication. If an athlete subject to the CADP has a prescribed need for medical marijuana, he/she should must apply for a medical exemption. This process entails an submission of an application in addition to supporting medical information. Sports’ departments across the country are well aware of USports’ stance on cannabis use. Nonetheless, they remain wary that their athletes could assume the league’s policy will correspond with the country’s change in legislation. It will be up to the student athletes, coaches, and athletic departments to clarify the rules amidst these changes. Here at StFX, an annual student orientation takes place near the beginning of the academic year. All 12 varsity teams are present, including their coaches and the rest of StFX athletics staff. At this year’s student orientation, presentations by Director of Athletics Leo MacPherson and his staff including Head Athletic Therapist Tara Sutherland, made it very clear that cannabis will remain banned for all athletes participating under the StFX and USports Banners. Another reminder of the status of cannabis regulation in sport is included in a mandatory e-Learning program provided by the Canadian Centre for Ethics in Sport (CCES). 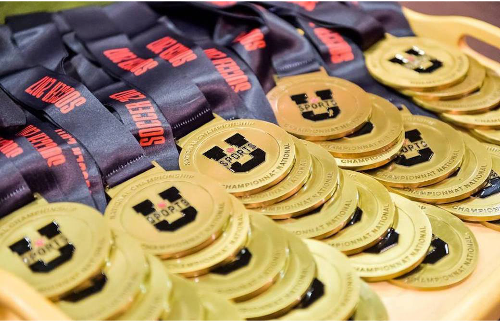 All USports athletes must complete this program before any competition, and should therefore be aware of the continuing prohibition of cannabis in their sports. CCES also has a Cannabis in Sport resource which includes a page for Frequently Asked Questions, Quizzes, an Education Kit, and more resources regarding medical marijuana. Student athletes are encouraged to use this resource to sort out any possible confusion.